Over the years we’ve had the opportunity to create Beer League logos and uniforms for teams in various sports across North America. Whether it be a logo for baseball, hockey, football, basketball, or soccer, we always enjoy creating and re-vamping team logos. A logo is big part of any sports team, it’s the team’s identity and having a great logo is important no matter the skill level. In this post we’ll look at our favorite logos that we’ve helped design over the past little while in no particular order! The Huskies logo is a simple, classic look that can’t go wrong. The logo also works across different sports. It can easily make a great baseball jersey but also works for basketball and hockey as well. The logo doesn’t have a lot going on, but it doesn’t need to. The Thunder Squad is a small adjustment to the logo of the ECHL’s Adirondack Thunder but looks great. If your team is struggling to come up with their own logo, it’s always great to look to the pros for inspiration. The Thunder Squad did exactly that and it produced a fantastic hockey team logo. Jaromir Jagr is one of the greatest to play the game and lends his face to make this one of the greatest beer league logos of all time. The gold triangle serves as a subtle nod to the Pittsburgh Penguins while the name Jagr Bombs is a play on the popular drink, the Jäger Bomb. It’s a fantastic logo with a fantastic mullet, what more could you ask for? Another Sharks logo makes our list with this one. 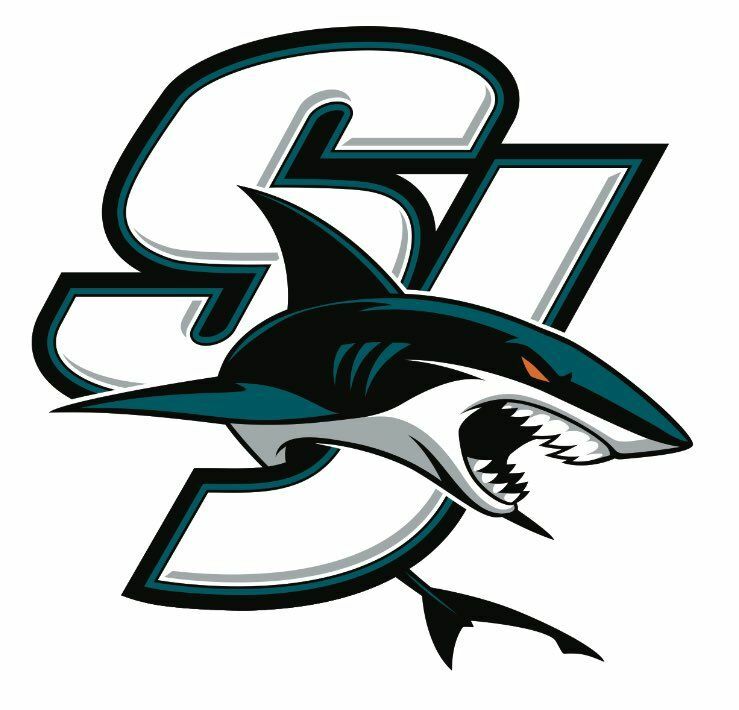 A fearsome logo based off of the San Jose Sharks shoulder patch, this logo knocks it out of the park. It can work for a hockey, basketball, football, and even baseball team. Once again the logo truly captures the essence of sharks and would have any team looking good. Bender, the beer guzzling robot from Futurama, lends himself to this logo. It checks all the boxes of a great beer league hockey logo, an iconic figure as the centerpiece of the logo, a hockey stick, a play on words, and of course, a beer reference. No one wants to be called a bender when playing hockey, but this team wears the name proudly. A knight is both a noble and feared character that makes it a great choice for any sports team. The Knights logo is sure to be the talk of the league for its detail and overall detailed design. The designated drinkers is a great logo for many reasons. It’s an original logo that features crossed beer bottles, a baseball, a diamond, and a solid reference. Add all these together and you have yourself a great logo for your beer-league baseball team. The Jaguars logo is one of our favorites. It features an incredibly muscular hockey-playing cat that would make for a great team mascot if it’s in the team’s budget. It’s a fun logo to look at and was just as fun to design. It’s a pretty sweet logo for a beer league hockey team and one we’re pretty proud of! We saw what a logo looks like when aspects are taken from another team or popular logo with the Thunder Squad logo, but this take it to the next level. Inspired by the Mighty Ducks logo, this logo features a moose head/mask in a similar style to the Ducks. Throw this logo on a Mighty Ducks jersey and your team will be the best dressed in the league! Jersey Factory is happy to design logos and uniforms for any team! We’re always willing to work with you and create the logo YOU want. Whether you already have something in mind or want something entirely new, we’re the right people for the job and this post proves just that. Get started on designing your custom beer-league uniforms at JerseyFactory.com NOW! Author Marc MazzulliPosted on July 24, 2017 January 11, 2018 Categories UncategorizedLeave a comment on Our Top Beer League Logos Designed by Us!